We’re at the midpoint of summer camp, a.k.a. the digital humanities institute at GMU. Each day has included some new tool (or three, or five) that have great potential for research and/or teaching, so much so that I went home yesterday with my head sort of throbbing with ideas. It’s pretty amazing how quickly we’ve been introduced to (and have mostly picked up) a number of great tools. Thinglink, Animoto, StoryMap, the Map Warper at NYPL, Google Maps and Omeka seem to offer the greatest possibilities so far. I’m eager to see how it all comes together, and what comes with it, in our next and final week. One drawback to a super-intensive institute like this one is the priority for content delivery, and lack of reflection. That’s just the nature of the program, unfortunately, unless the organizers were going to spread it out to a month or somehow figure out how to cut down on content. I tried to self-impose some time for reflection today, and negotiated the Fairfax bus & DC metro to make my way in to museum-land for a Saturday field trip. It’s been a great day, mostly revisiting old friends that were a regular part of my landscape when I lived here some years ago during my first sabbatical. 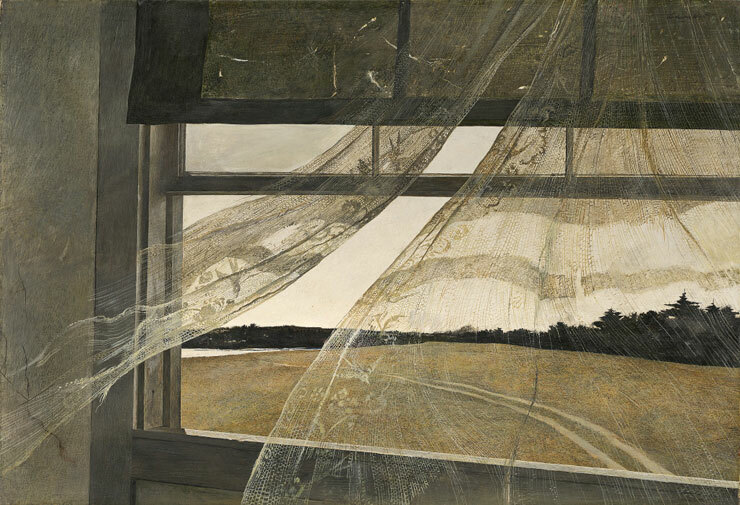 But there was also one great discovery made at a really wonderful exhibit of Andrew Wyeth paintings (especially watercolors) at the National Gallery. Wyeth was a known entity–in fact, he was hard to get away from during the time I lived in northern Delaware. But I’ve never seen his work in quite the light that was accomplished in this fine exhibition. In a week that has been all about learning new tools, and discovering new processes, and investigating new means of thinking and doing, it’s really refreshing both to just use my eyes to look at beautiful and compelling things, and to learn/discover/investigate the old-fashioned analog way.